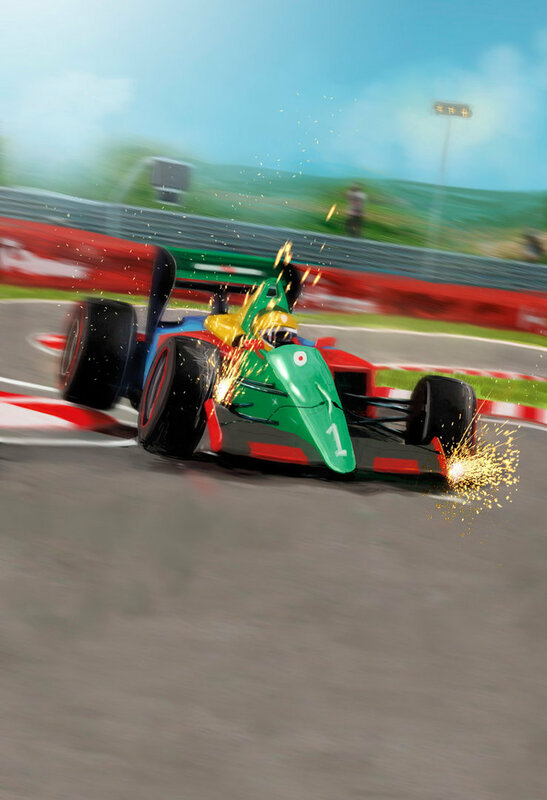 This is one of a set of illustrations I’m making for a new racing boardgame. They will be used mainly in the cards depicting the different events and strategies you can use in the game. The theme asked to me by the editor is F1 of the ’80 and ’90 years, with a “computer game” gusto and a enough realism. Of course the cars are inspired by the colors of famous cars of that period, but I’ve used a lot of interpretation on them, since It’s not even simple to find correct references. In most images I had to move the forward tires more apart from the body of the car, because the editor thinked they seemed to compressed. I think it was a perspective perception, but anyway, the effect is nice anyway and the car seems coming to the observer more, so let’s stay so.